Do you remember the days when Santa didn't arrive until after Thanksgiving? Today, Christmas shopping starts with a jolt the day after Halloween. Along with the earlier arrival of all those Christmas decorations comes an increased level of stress especially if you live with a restricted diet -- whether it be gluten-free, diabetic, paleo, for weight loss or any other health reason. If you want a little splurge this holiday season without going overboard, we have a nice surprise. 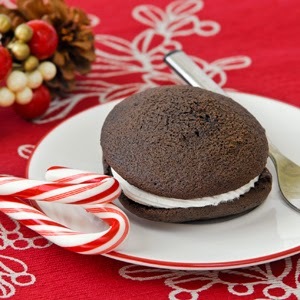 For this month’s featured recipe we chose our Mini Skinny Whoopie Pies because they are sweet and festive while still light enough for anyone counting calories. With just 28 calories and 3 grams of carbs, these lovely little whoopies pies are made with two of our gluten-free Skinny Chocolate Cookies. Believe it or not, the secret ingredient is shirataki noodles which allow you to make a delightful treat without wheat flour, extra carbs, calories, or fat. Easy to make, these bite-sized pastries will have you relaxed and enjoying the holidays guilt-free in no time. Serve each with a mini candy cane on the side, you'll add just 13 calories and 4 grams of carbs. Healthy Holidays! Preheat oven to 375°F. Open and rinse Skinny Noodles thoroughly with warm water in a strainer. Drain well. In a large dry frying pan, cook Skinny Noodles on high heat. Stir frequently. As Skinny Noodles begin to dry, they will "squeak," losing some transparency and shriveling a bit. Remove from heat. Let cool for 5 minutes. Place dry, cooked Skinny Noodles in food processor and process for 2 minutes, or until noodles look similar to gel. Add rest of ingredients. Process until well blended. Refrigerate mixture for 45-60 minutes. Cover cookie sheet with tin foil and spray with non-stick cooking spray. Drop mixture by teaspoonfuls on to cookie sheet. Bake 10 minutes. Let cool. Place 1 tablespoon of sugar-free Cool Whip between 2 cookies and serve.